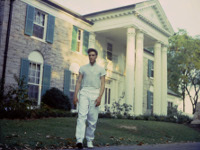 The winner will get return air fare to Memphis, Tennessee, plus three nights' stay at his birthplace, Tupelo, Mississippi and seven nights at the Heartbreak Hotel in Memphis including tours of the Rock 'n' Soul Museum, Sun Studio and National Civil Rights Museum plus platinum Graceland passes. There are also 20 pairs of tickets to be as runners up prizes to be won to Elvis At The O2. This London exhibition on the life and music of the King of Rock and Roll has been such a success that it's been extended until 10th January next year, plus on Wednesday this week Elvis' prized pink Cadillac car will go on display.